The transverse ligament of the atlas is a thick, strong band, which arches across the ring of the atlas, and retains the odontoid process in contact with the anterior arch. It is concave in front, convex behind, broader and thicker in the middle than at the ends. The anterior surface of the ligament is covered with articular cartilage to allow articulation with the Odontoid process. It is attached on either side to a small tubercle on the medial surface of the lateral mass of the Atlas. As it crosses the odontoid process, a small fasciculus (crus superius) is prolonged upward, and another (crus inferius) downward, from the superficial or posterior fibers of the ligament. The former is attached to the basilar part of the occipital bone, in close relation with the Tectorial membrane; the latter is fixed to the posterior surface of the body of the Axis; hence, the whole ligament is named the cruciform ligament of the atlas. 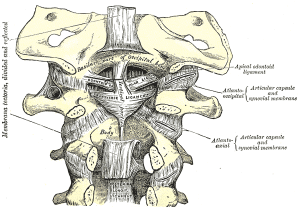 It divides the ring of the Atlas into two unequal parts: of these, the posterior and larger serves for the transmission of the spinal cord, its membranes and the accessory nerves; the anterior and smaller contains the Odontoid process. It functions to prevent anterior displacement of the Odontoid process. Clinical and quantitative analysis of patients with crowned dens syndrome.